The environment that swimming pool equipment operates in is extremely caustic. Unexpected repairs and unplanned equipment replacement can lead to costly downtime and customer dissatisfaction that can take weeks to rectify. Without proper maintenance, premature equipment failure is an imminent probability. Though not all disasters can be averted, Knorr Systems (KSI) can prepare a custom scheduled maintenance plan that will help ensure that the complete life expectancy of your equipment is met, if not exceeded. 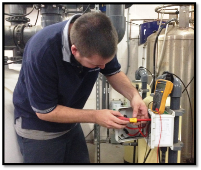 Our services are designed to assist your facility maintain system operations and proper water chemistry. Preventing aggressive water, which can deteriorate equipment, will also help preserve equipment warranties. As an aquatics industry leader since 1977, a KSI Scheduled Maintenance Agreement (SMA) can provide you the peace of mind that your equipment will last as long as possible. In addition, we also provide you with a long term forecast for the life of your swimming pool and equipment.